The H.I.P. H.O.P. Movement - The Dollicia F. Holloway Memorial Foundation, Inc. Many know H.I.P. H.O.P. as "music." We know it as the culture, unity, support and respect developed between individuals who are gifted in creative writing, public speaking and positive entertainment through music. Subsequently, The H.I.P. H.O.P Movement is a Community Enrichment Program and Youth Academy which focuses on various areas such as Financial Literacy, Entrepreneurship, Life Skills Coaching, Anti-bullying and Athletics. Our students will evolve from Fine Arts from creative writing, drama, dance and encounter cultural experiences and retreat outings. Ultimately, they will be encouraged to -Dream, Achieve, Rise and Explore! The program is currently being executed throughout the summer months commencing the 1st Monday after the July 4th weekend for six consecutive weeks for school aged children from 8 to 18 years old. Applications are available two weeks prior to the start of the program where it's a first come first serve basis until the maximum capacity is reached. Applications can be submitted right online! 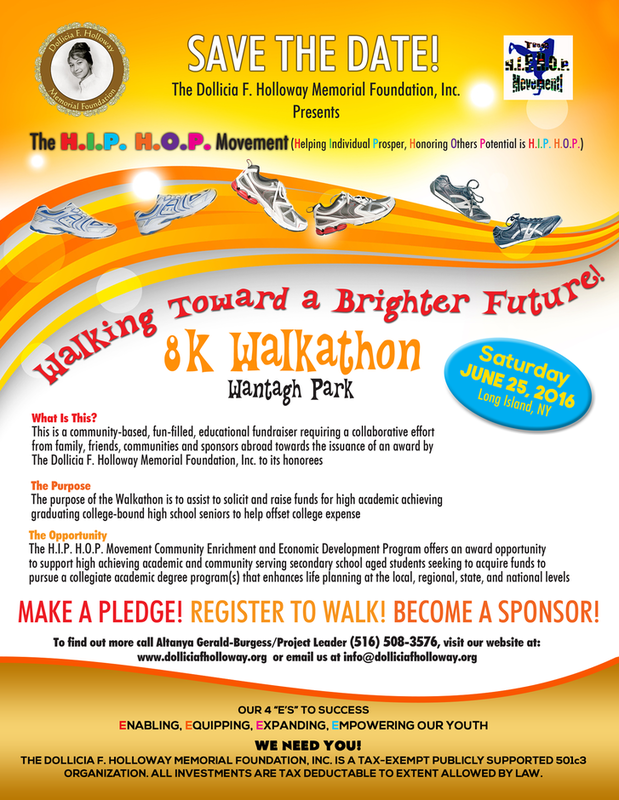 REGISTER TO WALK WITH US. See the link below to retrieve form then click the flyer above to pay now. Click the link below to retrieve the form to become a vendor.